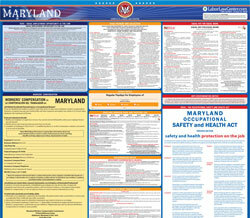 The Maryland Occupational Safety and Health Act (Public Sector) is a job safety law poster by the Maryland Department Of Labor, Licensing and Regulation. This poster is mandatory for some employers, including employers in the public sector. This poster must be posted in a conspicuous place where all employees in the Public Sector will see it. This poster discusses the safety and health conditions that employers are required to have in the workplaces of their employees as well as mentioning that inspections by the Commissioner of Labor and Industry do occur from time to time to make sure the safety and health conditions are up to code. Employees are also able to complain of unsafe or unhealthful working conditions as well as who to complain to. It appears you don't have a PDF plugin for this browser. Please see the link below to download maryland-moshpublicsectorposter.pdf. and health standards issued under the Act. and conduct on the job. the Commissioner of Labor and Industry. days of the alleged discrimination. employees of dangers that may exist there. programs in all workplaces and industries. illness to employees and supervisors.